I'm a roleplayer, not a rocket scientist! | Cattails: Become a Cat! I'm a roleplayer, not a rocket scientist! Haha, I also think I'm funny on occasion. 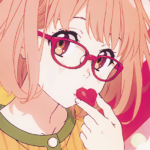 Anyways, my name's Mirai... Or, rather, that's the name I choose to go by. I'm twenty-four years of age (going on twenty-five), and I've been apart of the Warriors community ever since middle school. I didn't just start playing this game recently but it did take me this long to actually join the forum, which is... Arguably pathetic, I know this. You have to understand, though, man! I'm an awkward, lil taco who is on the spectrum and finds it hard, if not impossible, to branch out and that's on a good day. Mainly, I just watch anime and roleplay with a select few people that I know. Other than that, when they're not around, I game and do... Stuff and things. My main passion, outside of writing and gaming, would have to be watching anime... Which probably goes without saying. If there's a Discord, I might join it and if there's not, I won't be too fussed either way. I should also probably mention that to fill the void while I waited for a game such as this, I was that person who dabbled on ChickenSmoothie and in various roleplays, although... I didn't last long in either. In closing, if you want to get in touch, feel free to contact me on here. I can give you my Steam account name or my Discord if you'd rather use those mediums to get in touch (and hopefully stay in touch). Welcome to the forums! I hope you have fun. There are a lot of roleplays, you'll fit right in!